The brand launched in 2013, out of the brain of Tony Post (To-Po — get it?). Post is the former CEO of Vibram (as in Five Fingers) and before that did time at Rockport. After Vibram, Tony knew there was still something missing from the market—a shoe that allowed runners to access the important benefits of natural running while maintaining some of their favorite features found in traditional running shoes. Read more about Topo. Think of Topos as the happy middle ground of flexibility, cushion, ground contact, and foot-shaped toe box. While their trail line doesn’t (yet) include a max cushion offering, these kicks are a great all-around option with a roomy, wide toebox and a low (3-5mm) drop. I’ve put about 200 miles on my pair of Terradventures, and they’re quickly becoming the main utility player on the shoe shelf. I’ve been an Altra fan for years, but always found the women’s trail shoes to be a little too loose in the heel, which causes my foot to slip forward on steep downhills. Pros. What I love most about the Topos is their roomy-yet-snug fit. The Terradventures really hug my midfoot and heel, making them stay put on descents, but the extra roomy toebox still gives my feet lots of room to spread out. The lugs are deep enough for good traction, but not so aggressive that they’re overkill on tame trail. 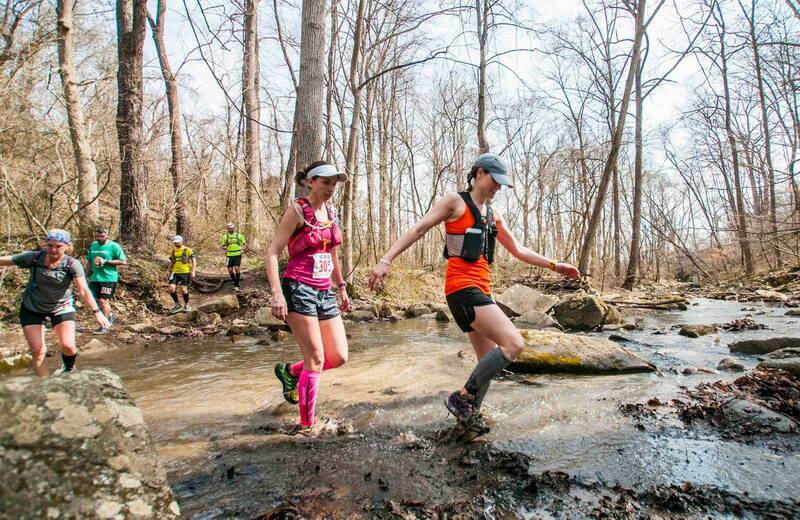 Sara (in orange) in one of the many creek crossings at the HAT Run 50K in March. Cons. The company still has some design wrinkles (literally) with the insoles. I’ve done two runs through knee-deep creek crossings, and when the insoles got wet they bunched up and creased like origami. At the HAT Run 50K in March I ended up ditching both insoles because they were so wadded up I was worried about getting heinous blisters. Topo knows this, and is working on a fix. “Unfortunately we have heard from a few customers that if water does get in the insoles tend to bunch up as you noticed, so we’re working with our product development team to see how we can improve that,” they told me. I got in touch because during HAT I promptly lost both insoles (whoops), but the fine customer service reps stuck some replacements in the mail. WIN! Look for a new insole design/material/tech down the line, until then I might grab a pair of minimal third-party insoles. Wish list. So far, the only shoe I’ve seen with a built-in Gaiter Trap is Altra. I’d love to see permanent gaiter fasteners on all my trail shoes. And as always, I’d love a max cushion offering. Overall. These shoes are lightweight and minimal, making them feel substantial and ideal for all but the gnarliest of terrain. I’d love to see Topo add a trail option with more cushion, but for now I’m loving these Terradventures. The Peal Izumi Train N2 had been one of my favorite trail running shoes. But last summer when Pearl Izumi announced they were leaving the running category to focus on cycling, I knew I would be left with a giant hole in my shoe rotation. 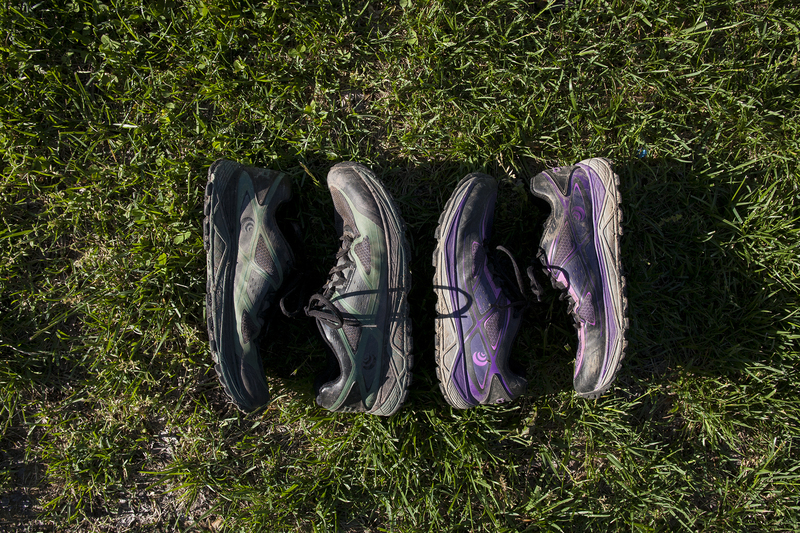 After trying many other shoes, the Topo Terradventures have more than filled that hole. Pros. The toebox is perfect. I find most running shoes are either too restrictive or they leave so much room in the toe that my foot slides around on the downhill. The Terraventures provide that Goldilocks just-right fit. The grip on these shoes is also amazing. From pine needles, to mud, to slick rocks, they have had no problem providing adequate tracking to allow for a quick turnover. Also, these shoes just feel fast. Cons. While I did not have the same insole problem that Sara has had, I do have issues with how the shoes handle stream crossings. The shoes just seem to take longer to dry out. At HAT I found myself annoyed and distracted that my feet seemed to to still be quashing out water long after I had crossed a stream. While I did not suffer any blisters because of this, it would concern me if I had a longer race with more crossings. Wishlist. I want these shoes to handle water better. Stream crossings are a normal part of an endurance run. And while I love these shoes, I may choose my Hoka’s instead if I am faced with multiple stream crossings during a race. Also, I’ll steal Sara’s and say a built-in gator trap. Overall. Despite a few negatives, these shoes are a home run. I have logged 325 miles in my Terraventures and they have held up amazingly well. I wouldn’t and have not hesitated to recommend these to anyone who wants a shoe that seems to meet the balance between what most other companies are currently offering, and does it better. Extra credit: Topo’s Hydroventure is made using eVent® technology. 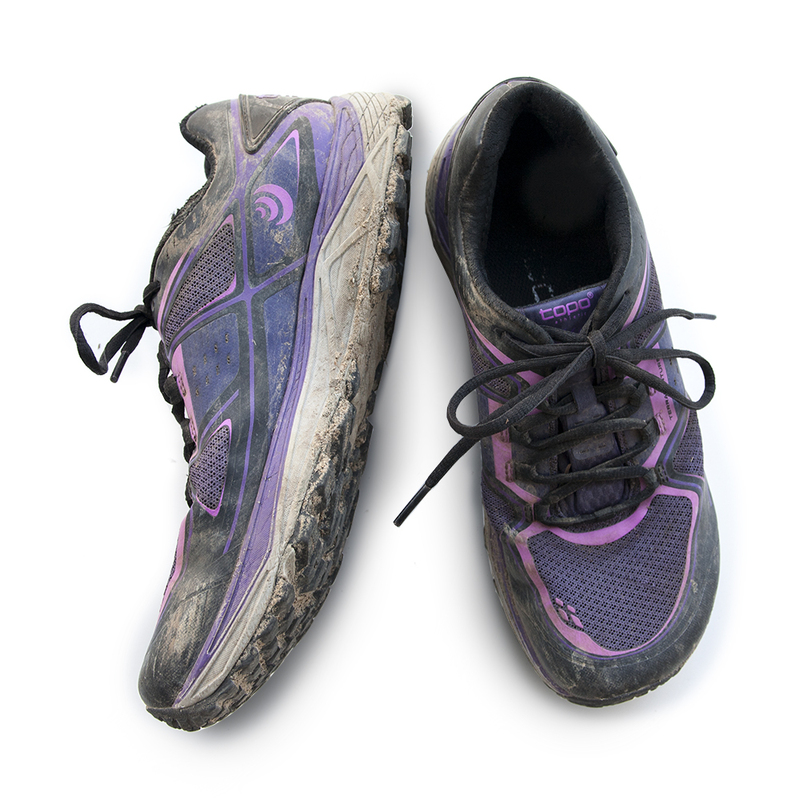 But, as with any waterproof membrane, if you get water in through the top of your shoe you’ll still have soggy feet. And keep in mind that most waterproof/resistant shoes either don’t drain or barely drain, meaning you could be stopping to pour our your kicks.